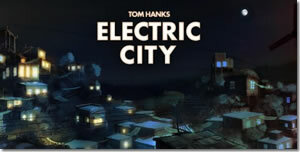 A 90 minute, 20 episode animated series called Electric City and featuring Tom Hanks, is being touted as a first-of-its-kind as it is a complete online interaction of social, digital, gaming and mobile media. The animated internet series about a good-versus-evil fight by the lead character may not normally generate too much attention, but having Tom Hanks attached to it changes all that. Yahoo have hired the two time Oscar winning actor to produce, write and provide his voice to the main character in Electric City. The show which is Yahoo’s first foray into original scripted content premiered on 17th July, and is available in several languages including English, French and Spanish. The series is created with Reliance Big Entertainment and Playtone and consists of 3-5 minute episodes, episode one called, “Truth or Consequences” can be seen now on Yahoo Screen. The show is not only for watching, but also has a navigatable 3D map, games, behind-the-scenes video etc. and also has links to discussions on social networking sites. The series which Yahoo is hoping will be popular enough to make it a blockbuster on the web, includes voice-overs from Hanks, Jeanne Tripplehorn, Holland Taylor and Ginnifer Goodwin. Hanks is not the only top Hollywood figure to try his hand on TV shows. Bryan Singer, the X-Men director is also planning a science fiction series called H+ later this summer. As the series is online based, the obligatory phone apps are available to accompany the show. Jump Games have launched the Electric City The Revolt mobile app for Apple’s iOS and Android devices. The app lets viewers/users play a roleplaying version of the game, read digital comic books and get some additional and exclusive content.